Here it is... that long awaited moment when I deliver more life altering news. Well, okay, maybe not life altering like winning the lottery or announcing the discovery of a new solar system, but something pretty awesome all the same-- our next read-along choice for the virtual book club. The poll was a little shady this time around-- not saving votes and all-- so I had to rely on official Facebook posts to determine the June book. Because we know that everything on Facebook is official and totally legit. Duh! 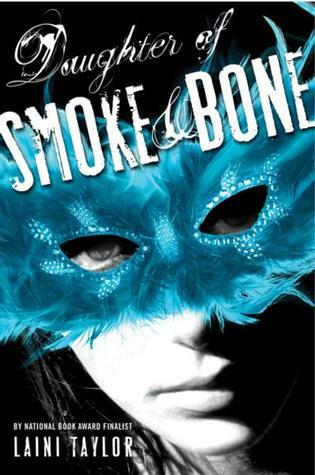 In June we will be reading, Daughter of Smoke and Bone by Laini Taylor. I'll be announcing more information about the VBC (virtual book club) on the 26th. That gives you plenty of time to get your copy ready! As a matter of fact, just skip the beach Memorial Day and hit the book store (since the library will be closed). Easy peasy. The offical read-along will begin on June 2nd. If you feel so inclined, I would appreciate the help spreading the word... maybe a Tweet or sharing the button? What ever tickles your fancy. Yes, the awesomeness shall commence soon. March was a blast with our first ever VBC read along. Thank you to all that participated!